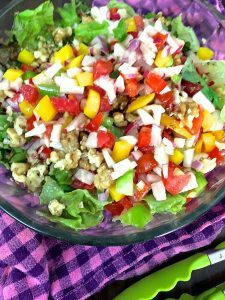 An easy to make salad that goes with practically anything – colourful, nutritious and with all the goodness of fresh vegetables. Dice the vegetables, add salad greens, make the easy flavourful citrus dressing, and there you go, earning brownie points all around with your Rainbow Fresh Chopped Vegetable Salad. One of nicest things about this salad is that you can add whatever fresh vegetables are available to you, and the proportions of the veggies don’t really matter. I have given a recipe but you can adjust the quantities, just making sure that items like onion or radish with a sharp flavour, do not overwhelm the other ingredients that make up the salad. 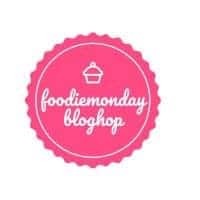 For the 170th Foodie Monday Blog Hop, Kriti Singhal Agrawal, whose turn it was this month, suggested ‘Detox’ as the theme. Kriti writes a very colourful looking blog, Krispy Kadai. I love the bright images of tantalising food arrayed all over her home page. Do check out the blog! Satiated with making and eating Diwali sweets and rich food, and even by just looking at the images of Diwali dishes on the internet, we were all grateful for an opportunity to make something refreshing and easy that did not involve hours toiling over the stove or frying goodies that are the epitome of the Deepawali feast. 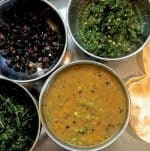 For me the choice was simple -either a low key soup or a rasam with plenty of tomato and black pepper, or else a salad. And from there it was a quick step to my favourite salad which Ive been making for decades, and which my Dad used to make for us: the Rainbow Fresh Chopped Vegetable Salad as I had named it. A Sunday tradition at home, after slicing vegetables for Upma, he would start on the veggies for the salad. I feel sad today to think that he did not have access to the many coloured sweet peppers, broccoli, fennel, the varieties of tomatoes and cherry tomatoes, the lovely lettuce and arugula that I can now source with ease. Even with the limited range of vegetables available to him though, he would make such a delicious salad. The Rainbow Fresh Chopped Vegetable Salad is just what its name suggests. A bunch of colourful veggies (the kind which can be had raw), some pomegranate; lemon and orange juice (freshly squeezed, of course!) and salad greens. Salt and pepper and olive oil and maybe chilli or garlic or ginger for the dressing. Try this salad the next time you make rajma and rice, or rasam or sambar and rice. You will be surprised at how it turns the meal around. I like it with masoor dal and with chapatis too. 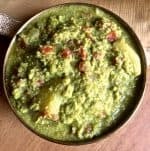 You can even make a wrap out of it (after taking out the green chillies, unless you are like our food blogger friend Vidya of MasalaChilli, who likes to eat green chillies and has been advising me today to eat a long green chilli to get rid of my perennial cough and cold symptoms). 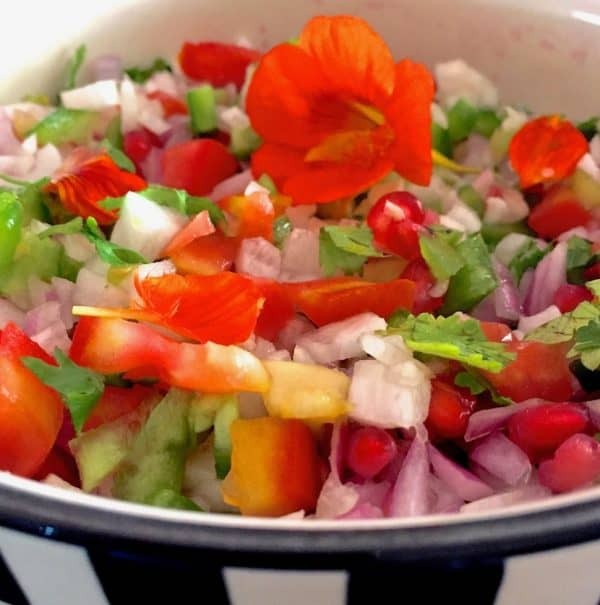 Vegan, Gluten free, tasty, easy to make, healthy, lovely to look at (oh and I often add edible flowers to the salad), this Rainbow fresh chopped Vegetable Salad is everything you can ask for in a side dish to brighten up your table. Make plenty of the salad, I guarantee it will all get eaten up. I usually plan 1.5 to 2 cups per person. Omit the onions in the salad if you don’t take raw onions, and also the garlic in the dressing, for a no-onion no-garlic salad. Make the dressing and keep it in the fridge till required. 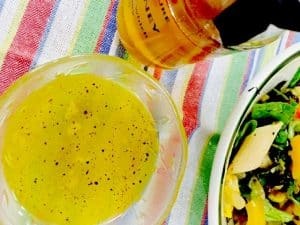 For the recipe, check the write up to this post (above the recipe card) where I have given the links to my recipes for Citrus Ginger Dressing and Garlicky Honey Lemon Dressing. The dressing adds a unique flavour to the salad, but you can otherwise squeeze 2 lemons and add salt and pepper and use that instead. Adding the seasoning (salt, pepper, chilli, ginger) to the dressing helps to spread the seasoning to the entire salad. Wash throughly and dry the vegetables with a kitchen towel. Peel the carrots, white radish and onion. Dice the vegetables into small uniform sized pieces. Wash the salad greens and the herbs, dry them in a salad spinner or with a kitchen towel. Shred to pieces. Extract the pomegranate arils from the fruit. Assemble the salad just before serving. Line a clean glass or porcelain bowl (or your favourite salad bowl) with shredded lettuce and other salad greens. Add the sliced vegetables one by one. Add just a little salt (remember, you have already added salt to the dressing) Toss the salad in the bowl till all the veggies get mixed. Garnish with pomegranate arils and the shredded herbs. Add salad dressing and toss again just before serving. 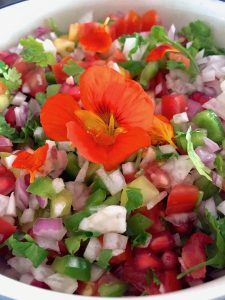 Love this simple, colourful and flavorful salad.Loved the idea of adding edible flowers. Fab share. Thank you Preethi! I make use of whatever herbs and flowers I am able to grow in my balcony. And the neighbours flower pots too! 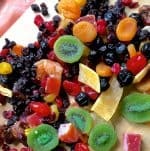 I love to add Colors to my platter and this wholesome rainbow salad with nuts and edible flowers is just my kinda food. Appealing nutritious and filling, perfect pair with the spicy Indian food. So true. the veggies they had were so simple yet made delicious salads. 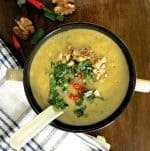 In your recipe i love the way you have added walnuts and edible flowers. Colourful and bright mornings. Thank you Seema! As Im trying to cut rice significantly from my diet, most days I have salad for lunch and adding nuts and garnishes does help give a variety! Salad looks so colourful and delicious. Loved your edible flower. Thanks for the easy, healthy and tempting salad. Awesome share. Thank you Sujata Roy! One of the advantages of living in Bangalore is to be able to grow herbs and flowers even in a small balcony, giving me a continuous supply of fresh organic produce. Wholesome, colorful…love the riots of colour in your rainbow salad. Even though your dad did not have access to broccoli, bell peppers etc, I’m sure he still must have made a colourful salad using locally available ingredients. I would love to have this salad on its own or with a wrap. Yes and thank you, Mayuri. His salads were delicious. Using it in a wrap – thats a lovely idea, which I must try! After removing green chillies, of course! Such a colourful salad. I would want to make this asap and have it. Looks very inviting!!! Thank you Veena! 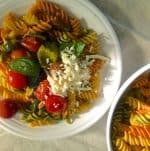 I love this salad for its versatility, adding whatever vegetables are seasonal and that I have on hand! Very apt name – Rainbow Salad! A great way to incorporate mixed vegetables, greens and turn it into a light lunch or evening snack. Filling and a great detox too. Thank you Vidya! This is my GoTo in Salads, specially when I have guests at home! Everybody loves it!